Photovoltaic (PV) energy offers the quintessential picture of self-sufficiency: A home with solar panels harvesting the energy of the sun to supply all of its own electrical needs. And yet, while that is a wonderful ideal, the situation in reality turns out to be not quite that straightforward. The reason is simple: The demand for electricity typically doesn’t coincide with the electricity production rates offered by solar panels. This mismatch occurs for a variety of reasons, including weather, demand patterns, and so on. Fortunately, technology provides some easy-to-adopt answers for those who are opting to self-consume PV electricity. Self-consumption is the model promoted and supported today by a growing number of countries for various reasons. However, PV electrical production varies throughout the daylight hours, based on available sunlight, but doesn’t ordinarily coincide with household demand. Thus, the typical system is rarely producing just enough electricity to meet the instantaneous demand. Rather, it routinely is overproducing, relative to demand, at midday and underproducing at night. For the producer/consumer, or prosumer, who wants to maximize the utilization of their PV energy, several strategies are available to make use of the excess PV electricity during periods of overproduction. Inject excess PV energy into the grid. Use a storage system to store the excess. Manage loads to operate during periods of high PV production. Strategies for load management, the third option, are the subject of a new white paper available from Schneider Electric. In it, the authors explain several approaches to load management in the context of residential applications that are proving to be effective in the self-consumption of PV electricity. Not all electrical loads can be shifted. Uses like lighting, cooking, and food preservation are not something that is easily shifted to another time of day. However, many energy-intensive activities such as heat pump, charging electric vehicles, heating water, and running pumps associated with pools can be set to operate during times of peak PV availability or otherwise managed with success. The paper explores three specific types of load management strategies. Sometimes small changes in regularly scheduled energy usage activities can yield significant improvements in aligning usage with PV availability. For example, delaying an early morning load cycle until midday can make the difference between using power from the grid and self-consuming PV electricity. This somewhat more sophisticated approach follows the on/off strategy but only initiates demand if the PV power available at the time is actually sufficient to meet the load. Otherwise, activation of the demand is delayed. This strategy shifts the timing of dimmable load and controls its power consumption to use only the PV production. Beyond describing these common approaches, the paper presents several examples of how these strategies can affect electricity demand and use, and the economic implications of effective demand management. Various technologies are also discussed that can help in the process of managing the use of electricity in domestic applications. 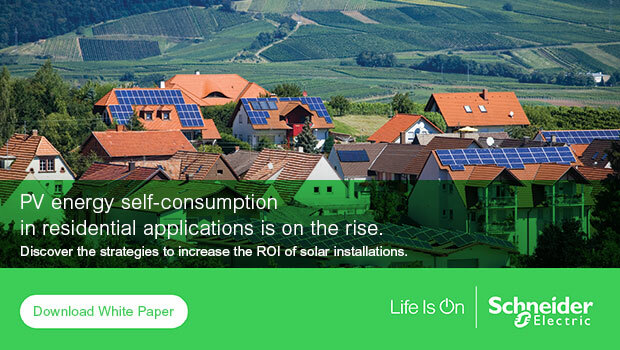 Download the free white paper “Impact of load management on PV self-consumption in residential sector” to learn how effective load management designed to maximize self-consumption combined with the sale of excess PV electricity back to the grid can result in non-negligible savings for the prosumer.